How did it become Friday without my weekly posting of Soup? Veggie girl (or “bunny ” as we call her) has been asking for a bean soup for a few weeks now, she loves beans. But not the canned ones, only dried ones, either soaked overnight and then cooked, or with the quick soak method explained here. She swears they taste better, with a firmer texture on the outside yet still soft in the center, if cooked just right. Unlike the canned version, all soft, according to her. I agree, smart kid! 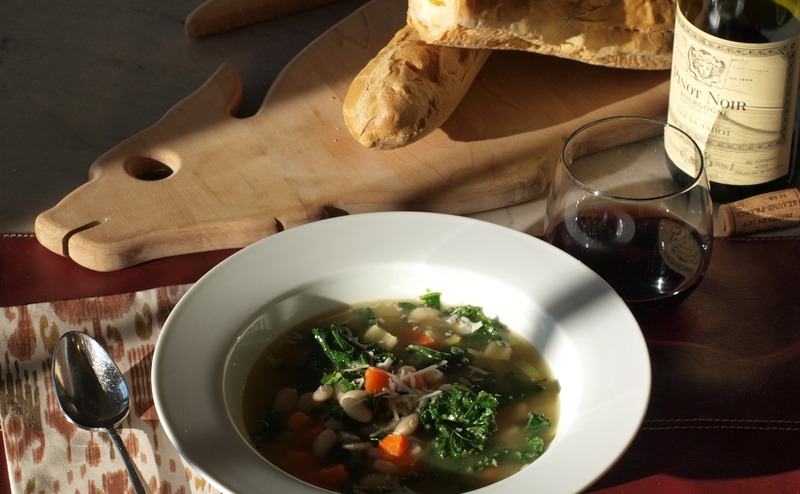 I made this quick, super tasty and healthy (kale does that) Kale Soup last night. It was a big hit. With so many vegetables in the soup we omitted the usual salad and had garlic bread instead. The Carnivores and I added crumbled sausage to ours, the veggie girl (bunny) definitely didn’t. She loved it, asked me to warm it up and put in her thermos for lunch today. Don’t you just love it when you make something for dinner and they ask for more, sigh, love that. How large is a “carton of vegetable or chicken stock”? Sorry I didn’t add a measurement, 1 carton of stock equals 32 oz or 4 cups.